Oceanfront beach retreat. 5 Bedrooms and 4 Bathrooms. Bright and spacious home with beautiful wood paneling. Well maintained decor from days gone by. Fully equipped kitchen with dishwasher and microwave. Lots of seating at the oversized dining table. Large living area. 3 televisions, DVD player, wireless internet access and unlimited domestic long distance phone service. Washer and dryer. Exterior seating, sundeck, charcoal grill, outside shower and private walkway to the beach. Beautiful gazebo for watching sunsets over the dunes. Nonsmoking, no pets. Sleeps 19. Upstairs: King/Double, 2 Doubles, Double/Single. Downstairs: King/Double, King/DoubleOceanfront beach retreat. 5 Bedrooms and 4 Bathrooms. Bright and spacious home with beautiful wood paneling. Well maintained decor from days gone by. Fully equipped kitchen with dishwasher and microwave. Lots of seating at the oversized dining table. Large living area. 3 televisions, DVD player, wireless internet access and unlimited domestic long distance phone service. Washer and dryer. 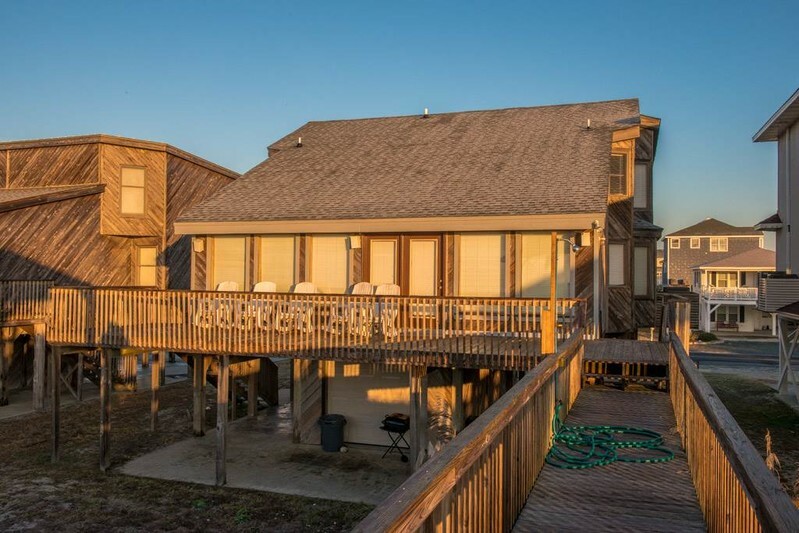 Exterior seating, sundeck, charcoal grill, outside shower and private walkway to the beach. Beautiful gazebo for watching sunsets over the dunes. Nonsmoking, no pets. We had a large group of 19 and there was plenty of room! The pictures don't do justice of the size and expanse of the living space. The kitchen was well stocked with kitchen supplies, which is always a bonus. Most important was easy beach access! We would love to stay here again!